while you are reading this, I will be strolling around beautiful Vienna with my darling. But I queued up a couple of posts so my blog won't be left behind while I travel. 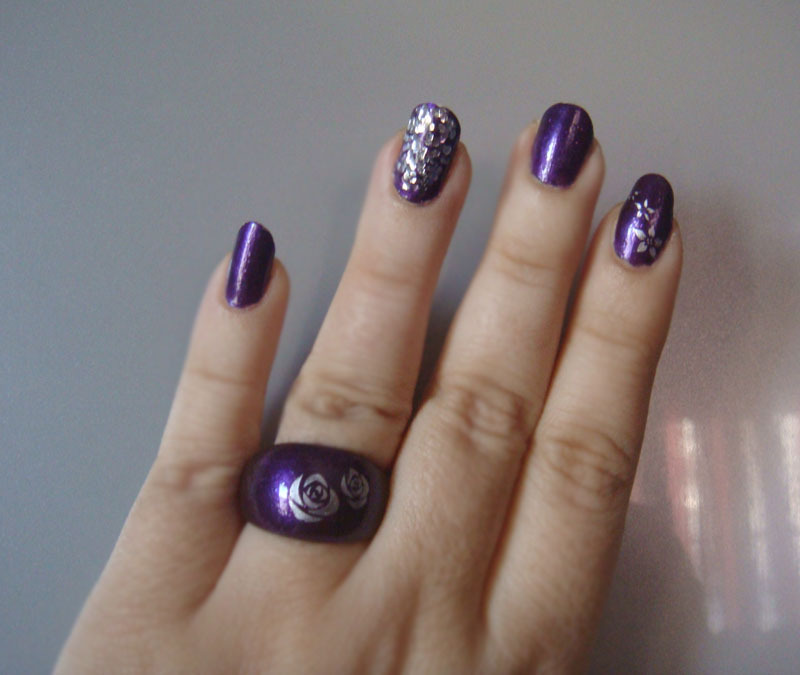 For this post I have chosen to show you a manicure I did a while ago, that goes well with the day I think. For the base I used two coats of Orly Velvet Rope, one of my favourite purple nail polishes. Then on the ring finger I put silver spangles and on the index fingers I stamped some flowers using China Glaze Millenuim. Sealed everything with a coat of Seche and the my nails were ready! I loved how the combination turned out, so I decided to make a matching ring as well. For those who are interested, I will post a tutorial on how I made this at a later time. Very pretty! Have fun in Vienna!! Gorgeous to the mani and ring! Have a great time in Vienna! This blog is a personal blog written and edited by me. For questions about this blog, please contact celdeconail@gmail.com.